Knock Knock Baby: Every woman should know this before she has a baby! Please do this simple test for Candida.... it could change your (unborn) baby's life! This is what your blood can look like when you have candida (and have been eating way too much sugar). Many people may not be aware of this, as I wasn't.... until I looked at my own blood under a microscope, and was utterly MORTIFIED. This is not my own blood (it's blood from a woman in a video you can see further down the page). But my blood looked so much like this, when I had been consuming a ton of sugar, and it's scary to think I had no idea just HOW BADLY that sugar was damaging my body... or could be damaging to a growing baby! I figured there are a lot of women out there who probably have no idea, either. Just think about it.... when you are pregnant, you are SHARING your blood with your baby. Do you really want blood that looks like this, to wind up in your baby's body? The thing that's frightening about candida and too much sugar consumption, is that we can feel good despite the fact that our blood looks like this.... so many women can be completely unaware that this is what's really going on, inside their body, when they're consuming a lot of sugar! Years ago I spoke to a woman who said that she was sure (based on a bunch of research she had read) that Autism is caused by a woman having too much yeast in her body while she is pregnant. That always stuck with me, and recently I did some more research about it. I know it sounds crazy, but... I would have to agree, there is a lot of evidence to support the theory that there is a strong link between yeast overgrowth, and autism. And the scary part of that is, a lot of women may not even realize they have an overgrowth of yeast! What is even more scary (and disturbing) is to think of how many women will never hear this from a doctor. I also discovered that I am one of those people who has too much yeast (which can lead to endometriosis, which I am pretty sure I had... and I know for sure both of my aunts had it... and it caused infertility in one aunt and pregnancy complications in the other). It was a real wake up call to find out that I have Candida, or Candidiasis - which I believe was the root cause of my (what I suspect was endometriosis). I did not realize I had this. I always thought I had a high tolerance for sugar, and didn't realize that the amount of refined sugar, soda and other junk I was eating could be causing such major complications with my health... or my ability to conceive and carry a healthy baby! (It's not that I always eat like this, but I definitely go through phases). I want to make it clear that I do not think yeast is the only thing that causes Autism, or that this means women who have Autistic babies must have had yeast issues. I know that is not always the case. And I know that many women who have autistic children did nothing wrong and probably did everything they could, to have a healthy baby. Nobody is to blame. But it is frightening to think that almost no doctors ever seem to mention that there could be a connection between yeast overgrowth (which can be caused by something so simple as eating too many foods with refined flour and sugar, like boxed cereal, bagels, crackers) and autism. I am guessing the biggest reason they don't mention it is, they have never heard of the connection... and even if they did, I'm not sure they would believe it to be true. For me, I can develop major yeast / candida problems by just eating too many of the wrong foods (that are considered normal in the American diet). Bagels, bread, pasta, cereal, crackers, soft drinks, beer (ok I know the soft drinks and beer are not exactly considered "good for you" but I'm just saying... it's easy to not realize how bad they really are, when they are so heavily advertised in the US... you'd practically think these things are good for you!). All of those things started to give me allergic reactions (namely, ITCHING) which I hated, but now I think of those allergic reactions as a blessing. There I was, trying to have a baby, while I had an underlying issue with candida, which could have caused some serious health issues for a growing fetus. 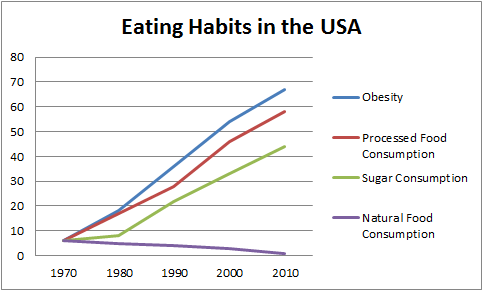 The American diet has so much more sugar in it now, than it did 40 years ago. And the rate of Autism has risen 600 percent in the last 2 decades. Please have a look at the similarities between these charts below. I know this doesn't mean there's definitely a connection, but... it's something to think about. 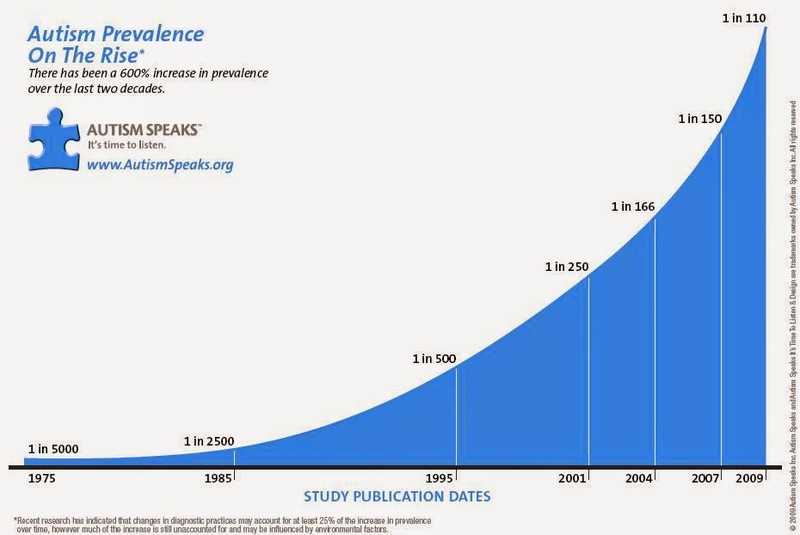 ... and see how it compares with this chart, that marks the rise in autism since the 70's... do you see how, in both charts, there is a plateau in the 70's, but a very noticeable rise in the 80's? I don't know if this is from the PepsiCola company getting Michael Jackson on board with commercials in the 80's, or what, but.... SOMETHING's got us all consuming WAY too much sugar! And the increasing size of soft drinks that are given in fast food joints definitely does not help matters. You can see if you have Candidiasis by doing a simple "spit test" in a glass of water (sadly, I FLUNKED this test... BIG TIME!!). The information below, showing how to do a candida test, can be found on this page. Saliva Test: A simple test to determine if candida may be a problem is to do spit your saliva into a glass of water, upon waking in the morning. Do this prior to putting anything into your mouth. You may have to work up some saliva to spit into the glass, and may do so a few times to ensure that you have enough in the glass to cover the surface of the water. Observe the reaction of the saliva in the glass every few minutes for a half hour. If there are “strings” coming down from your saliva, if the water turned cloudy, or if it sank to the bottom – chances are that you probably have candida! If you do NOT have a candida concern, your saliva should stay at the top of the glass and will eventually dissipate after 30 minutes. 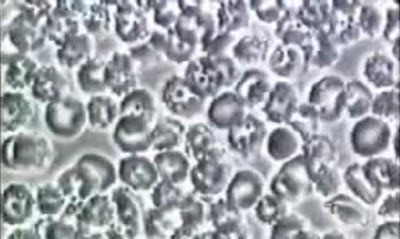 Although this simple test is a relatively quick, economical way to determine if you have a yeast problem, sometimes people will test negative so it is best to pay attention to the symptoms presented and see your physician who can then perform further studies. I would encourage any woman who is planning to have a baby, to please google "candida," "yeast," and "autism" or "autism connection." Don't just take my word for it... please look it up and draw your own conclusions. The article below is from THIS PAGE. Understanding fungal infections may be the key to unlocking the mystery of autism. When a woman has a systemic fungal infection (candidiasis) she can infect her baby, and neither of them may have any visible symptoms! Babies born with yeast in their gut (inherited from mothers with candidiasis) lack the normal healthy bacteria that establish a thriving immune system. Side note, added from this page: Most people, including many physicians, do not realize that 80 percent of your immune system is located in your digestive tract, making a healthy gut a major focal point if you want to achieve optimal health. A baby's blood-brain barrier isn't formed until 6 weeks after birth. Before the blood-brain barrier is formed,there is potential for fungal, bacterial and viral infections to enter your baby's brain. A baby born without an inner ecosystem and therefore a healthy immune system is not a good candidate for vaccinations like the MMR (measles, mumps, rubella). Their weak immune systems cannot develop antibodies to the viruses and instead the infant actually becomes infected with the disease that the vaccination was intended to prevent! Vaccinations were originally created for people with strong immune systems who had resistance to the pathogens that were injected into their blood stream. Newborn babies have not had time to build strong immune systems. Without a healthy inner ecosystem, the immune system will never be strong. Most parents of autistic children tell us that their child appeared to be "normal" upon birth. They may have had some health issues like digestive disturbances, constipation, frequent colds and ear infections - yet when vaccinated (often with the MMR at 18 months) their child began to regress in their language development and social behaviors. They behavior even becomes abnormal, much like a schizophrenic. If you look at photos of these children you can see from their eyes that they appear to have an infection in their brain. Our theory at Body Ecology (based on my research) is that upon inoculation with these three live viruses, the child who is not strong enough to be vaccinated is instead infected. The mumps virus in particular will cause the child's blood pressure to elevate. Elevated blood pressure will open the blood brain barrier. Any infections in the body can then easily enter the brain. Even though current research shows clearly that the blood-brain barrier opens when blood pressure is elevated, your child's pediatrician may not know this, since it is not taught in medical school. While a child is supposed to develop immunity, his/her immune system is not developed because the inner ecosystem was not established and maintained at birth. 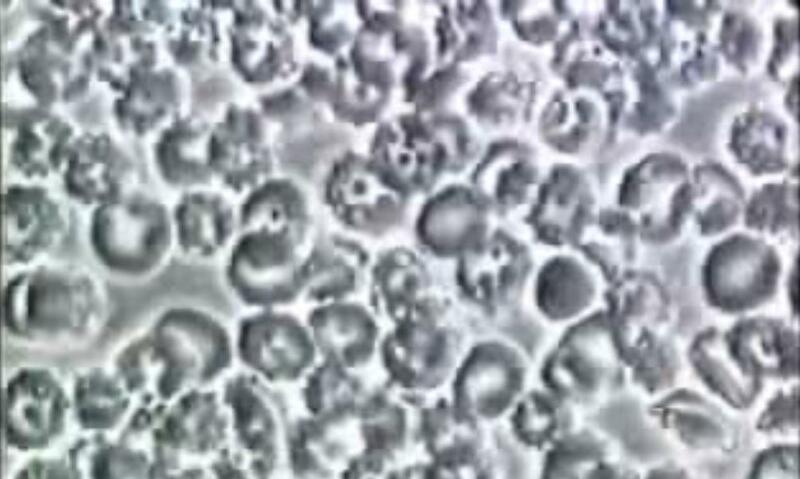 The immune system is already overwhelmed dealing with an inherited fungal infection. The child has no ability to resist the assault from 3 live viruses: measles, mumps and rubella (measles has been found on the gut wall by Dr. Andrew Wakefield). For more on autism and fetal health, read The Myths and Truths of the Mercury/Autism Connection. Establishing a vibrant inner ecosystem is just one way an expecting mother can influence her baby's health; a mother's mood can also help or harm her unborn child. When the adrenals are healthy, a person is calm and centered with excellent mental focus. Children who experienced expanded adrenal cells in the womb will be highly intelligent but will find it difficult to concentrate. These children are usually diagnosed as having ADD or ADHD. Nutrition and lifestyle can significantly impact your health and the health of your baby. If you are planning to have a child, the Body Ecology program is your foundation for creating wellness. The Body Ecology program's emphasis on establishing a healthy inner ecosystem, cleansing your body of built-up toxins, and nourishing your adrenals is an ideal way to prepare your body for pregnancy. If you are thinking about becoming pregnant, it's not too late to start thinking about your own health! Start the Body Ecology program - this will help both parents build health and vitality to pass on to baby. Build up a storehouse of nutrients in your cells. Eliminate toxins that have been accumulating in those cells throughout your life. Eliminate stress as much as possible before and during your pregnancy. TIP FROM ELLIE: STAY AWAY FROM EXCESSIVE SUGAR! In the first minute of this video you will see what normal blood is supposed to look like. And then if you scroll to about the 1 minute mark you will see the blood of the woman who had blood like mine (when I was consuming excessive sugar) looked like (the pic at the top of the page). 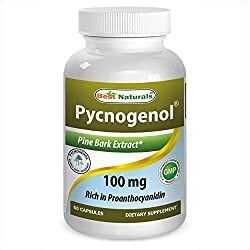 She took pycnogenol, but pycnogenol is pretty expensive, so I drank antioxidant water, which helped (both are very powerful antioxidants, and I believe the water can give you more antioxidants for less money, than pycnogenol). HOWEVER, I do want to point out that I was consuming SO MUCH sugar, no amount of pycnogenol OR antioxidant water would be able to fix the issue completely, until I eliminated the source of the problem: Getting rid of the sugar. It's not that I never have any sugar at all, but just eliminating sugary drinks, for me, was HUUGE. In addition to antioxidant water, I would highly recommend taking probiotics, which greatly helped me to clear up my athlete's foot (a sign of candida, which I didn't understand was a sign of candida!). I would also recommend coconut oil, which I've found to be more effective than anything else I've tried (and I've tried a LOT of stuff)... to kill candida. You can even use this vaginally, with probiotics, if you're getting a yeast infection. This brand of Coconut Oil has the best reviews on Amazon... over 5,000 reviews with a 5 star average. It's really inexpensive, and Organic! The kind I got was from Costco but I wish I'd gotten this kind instead, because Costco only sold a huuge tub of it, and it could go bad before I'm able to use it all! the 16 oz jar shown above is around $12, but for less than $5 more you can get twice as much! Please note that there are several different books you can check out on Amazon, (that have high ratings), that can help you beat Candida. You can see some of them here. If you have any friends or family members who are trying to get pregnant, please share this information with them!